"Considerably better than most — if not all — of the recent LDS cinema." A FILM OF GREAT INSPIRATION! After experiencing (not just seeing) this inspiring film in a theatre I turned to my wife and said: "Who would have ever thought that we would have had such an inspirational experience in a commercial theatre?" After seeing this film when went downtown to the Joseph Smith Memorial Building and watched JOSEPH SMITH: THE PROPHET OF THE RESTORATION again. Then the following week returned to the theatre to once more feel the beauty of EMMA SMITH: MY STORY. I have since bought the DVD, the Blu-ray and the CD of the beautiful score. I rank this film as one of my great spiritual film experiences. The Church film of JOSEPH SMITH is also on DVD. I have always had a reverence for Emma. I can't imagine going through everything that she did. I've always disregarded comments from people who would discredit her. I never had the money to go see this movie, or to buy it. I was so grateful that they showed it right after conference was over. I'm not the type of person who likes to cry - but the tears wouldn't stop. This is such a good movie. I would recommend it to anyone - but especially to those who don't understand her role in this world. Elect Lady is the perfect title. She was/is amazing! & so is this movie! I can't wait to have enough money to purchase it! It would be my most prized movie I'll ever have! Emma Smith was such an incredible woman. Her love and devotion to the gospel and her husband were amazing! After watching this story, it makes me want to learn more about Emma. She was such a great example to all of us, as she truly endured to the end. It is a beautiful love story!! since I was a Beehive my thoughts have turned to whom Emma truly was. After study and searching within my heart I know Emma is an elect lady. her trials mostly her triumphs have left a tender mark in my life. This movie showing Emma telling her daughter Julia all about her life & experiences touched me in more ways then I felt this production would. I cried, laughed, enjoyed each moment. Katherine Nelson & Patricia Place portray Emma with amazing grace. This movie should be in each LDS home video library. Along with the movie about Prophet Joseph Smith. I thought it was fantastic that finally a movie was produced to convey Emma's side of the story. I believe we all could learn from Emma...she was very strong. I really enjoyed it and I esp appreciated the fact that the producer used the same characters to portray Joseph and Emma that have been used in other LDS documentaries. I think the actor/actress chosen to play Emma and Joseph are right on. Good work and well worth it to add to your DVD library. I looked forward with great anticipation to seeing "Emma Smith: My Story" and was not disappointed. Few movies have the power to transport us so completely into their world as this movie succeeds in doing. From the opening scenes, I felt as if I were a fly-on-the-wall in 1800's America, living alongside the early saints, getting an insider's peek at the life of the fascinating Emma Smith. I was impressed with the moviemaker's ability to craft and convey her story so well, giving the viewer an overall sense of the life and times of Emma Smith while also sharing some of the intriguing and sometimes very human details of her life. The themes of the movie -- seeking for gospel light and power, choosing faith over fear, and finding joy during difficult times among them -- were well chosen and truly compelling. The movie offers a visual feast with its period costumes, lovely settings, sumptuous lighting, and wonderful cinematography. 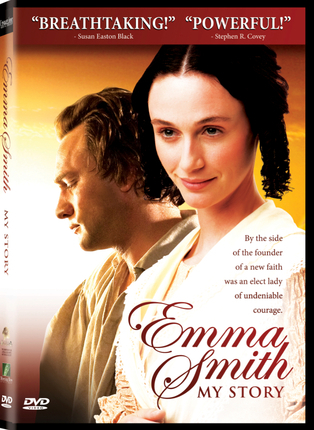 I enjoyed the movie and feel inspired to learn more about Emma Smith through one or more of the biographies now available. This DVD would make a great gift, especially for sisters who love a story about a woman of great faith. -- Debra Sansing Woods, author of --Mothering with Spiritual Power: Book of Mormon Inspirations for Raising a Righteous Family--and--It's Okay to Take a Nap: and Other Reassuring Truths for Mothers Everywhere. It is nice to see a movie that depicts Emma in a good light. She is a misunderstood woman in history. This was really nice to see things from Emmas perspective. I've always wished for a movie like this. I thought it was well done, without being overly dramatic. I learned quite a bit and thought the cast was chosen well. This is one of the best movies i've seen. It gave me great respect for a great lady! I enjoyed this movie a great deal. It gives an accurate review of Emma's life and the many struggles that she went through. Many people seem to have forgotten or possibly never knew the struggles Emma endured. This helped to clear the record a little and I really enjoyed the whole movie. This is one of the most incredible movies I've seen. I was a little worried about what it might contain, but they did an incredible job show the life, worries, concerns and faith of Emma. It takes the opportunity to teach us from her experiences. This movie left me speechless. Well written story of an elect lady. I saw this movie at the theater this summer and enjoyed the outlook of Emma from her daughter. It is worth adding to your library. This movie is both inspiring and humbling. I really got an insight into the life of an elect lady that was devoted to the prophet and to her family. She so believed in prayer that she disobyed her father and prayed when her heart was in need of comfort from the lord. I believe that every lds woman should see this. This is a wonderful movie. After seeing it I wanted to watch it again. I cried. It made me realize what Emma and her family went through. Wonderful!! If you have seen the wonderful movie Joseph you have seen this movie. It used clips from the Joseph movie all the way through which made up almost the entire movie. A little disapointing as i had been looking forward to this movie for a while, only to realise i had already seen it. movie is very well made and very informative. There are many people involved to make anything a success and Emma seemed to be the person who truly was a helpmate. I enjoyed this movie very much. Sometimes we forget about how hard it must have been for her too. This was well done. I took my Relief Society President and my friend to this birthday. It made the sisterhood between us grow even stronger. You should watch this movie with all your Sisters!